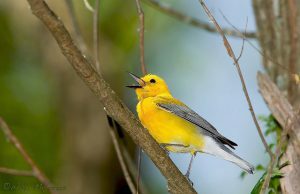 The following is a list of easily accessible birding spots with a short description of each and a link to a map. Where available, links are also provided to more detailed and extensive descriptions on other websites. Reclaimed and cleaned up by the Ellerebe Creek Watershed Association, there is a 10-acre pond with associated wetlands and some upland forest. The park is an oasis in the middle of a highly urbanized part of Durham. Year round. One of the best birding areas near Falls Lake. A peninsula of land between the Flat River and Knap of Reeds Creek at the westernmost end of Falls Lake. Many different habitats including forests, fields, ponds, swamplands, and riparian river bottoms. Year round, but best birded on Sundays during hunting season. This old bridge, now for pedestrians only, and its environs is a great place for viewing riparian birds, especially warblers in the spring. Easy walking trails lead to both the ‘wooden bridge’ and ‘concrete bridge’ over New Hope Creek. Also a more difficult trail along the creek requires climbing over rock outcroppings. Good forest and riparian habitats. Year round. This is the best spot to view the center of Jordan Lake. Can be especially good for water birds (sometimes rare ones) fall, winter and spring. Can also be a migrant trap in fall. Part of the restoration project of the Ellerbe Creek Watershed Association. Forest and riparian habitats in a residential area of northwest Durham. Year round, but especially good in migration, spring and fall. Fields, forest, and riparian habitat. Good year round, but especially nice in spring for migrants with lots of wildflowers. Good view of the lake for winter waterfowl, as well as forests (pine and/or deciduous) and beaches. Fall, winter, and spring. This trail along the Eno River is paved along most of its length, making for easy access. Forest and riparian habitats. Year round. Near RDU airport. Open water and shoreline can be good for waterfowl and shorebirds late summer through winter. Good spot for migrants, spring and fall. 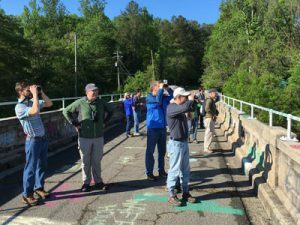 Under the auspices of the NC Botanical Garden, this is perhaps the most popular birding spot in Chapel Hill. Access requires driving across a ford over Morgan Creek, but except for times of extremely high water, this is passable in most passenger cars. Fields, forests, wetlands. Great year round. Though small, this is a wonderful park for forest and wetlands birding, especially spring and fall, but also year round. NHAS installed a Chimney Swift tower in the park. 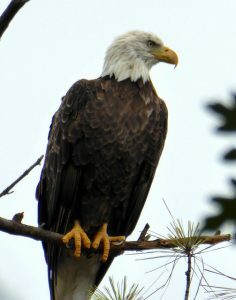 A good place to look for Bald Eagles (year round) and Ospreys (breeding season), especially early morning. 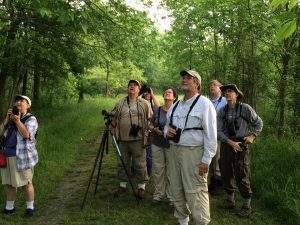 Easy hiking trails through woods for land birds. Year round.